7 Bedrooms, 4.5 Bathrooms, Sleeps 14. Lake and woodland conservation views. Wilderness Lodge is a large premier villa located in the beautiful Emerald Island Resort. It has a south facing private pool plus spa with amazing views over a beautiful lake and woodland conservation area. The Emerald Island Resort is one of the closest to Disney World, yet secluded enough to enjoy quiet evenings and spectacular Floridian sunsets. Featuring 7 bedrooms and 4.5 bathrooms the villa can accommodate up to 14 people for a truly magical holiday experience. Wilderness Lodge features a family lounge with a superior entertainment system. Boasting a large TV with cable, Nintendo Wii, DVD player, a high quality sound system, a DVD and book library and board games the entertainment system will keep all of the family entertained for those relaxing evenings. With a top of the range slate bed pool table, air hockey and foosball in the games room hours of fun are to be had by both adults and children of all ages. The pool area features a south facing heated pool with spa which captures the sun from sunrise to sunset. Surrounded by a large pool deck with lots of loungers, seats and tables there is plenty of room should you choose to cool off in the pool or sit back, relax and enjoy the tranquil lake and surrounding conservation area. A large, high spec gas BBQ will give you the perfect excuse to eat “al fresco” in the picturesque surroundings of the lake. The pool area has a child safety fence and alarm on the patio door giving you peace of mind if you have young children with you. If the sun gets too hot you can always cool off under the lanai or inside the villa which is fully air conditioned. There are 2 master bedrooms with king size beds and en suite bathrooms, a queen size bedroom and 4 twin bedrooms. The 2 master bedrooms boast walk in wardrobes while all other bedrooms have built in wardrobes, with carefully selected luxurious furnishings each room has an individual and unique décor. One twin bedroom features bunk beds with a Mickey and Minnie Mouse theme, while the other twin bedrooms have their own unique themes, tropical, beach and boutique. All bedrooms have cable TV. There are 4.5 bathrooms all tastefully decorated with flowers and supplied with towels, soaps and toilet rolls upon your arrival. All feature hairdryers. The kitchen boasts all the amenities one could want and is fully stocked with all cutlery, cups, plates and pots and pans. With an island and spacious counter tops the kitchen is perfect for preparing snacks or large meals for the whole family if you choose not to eat out at one of the many local restaurants. The open plan kitchen also features a breakfast table that looks out upon the conservation area, perfect for preparing yourself for a fun day at Disney while watching the sun rise. The kitchen is supplied with a free grocery starter pack so upon arrival you can make yourself a quick snack and rest after travelling. Wilderness Lodge features a reception lounge that leads onto the dining area, perfect for eating meals in style and comfort with family and friends. There is wireless broadband internet throughout the villa and free local and national calls from the telephone ensuring you can keep in touch with friends and family or conduct business during your stay. A washing machine, dryer ironing board and iron are provided in the utility room. Travel cot x 2, Buggie x 2 and High chair x 2 are provided free of charge. Wilderness lodge is perfectly located for all local amenities and attractions, the choice is absolutely amazing (times given are by car). •	Clubhouse with concierge service, cyber café, arcade, tiki bar, meeting room, gym and seasonal events. •	Communal pool, spa and sauna. Owned by a family with a good knowledge of the local area, we will do everything we can to make your holiday one to remember! Our family first visited Florida in 1995 and have made it a regular holiday destination ever since. After our first few visits we discovered Emerald Island Resort and continued to rent villas there as it is superbly located and all the villas are of outstanding quality. We enjoyed Florida so much over the years that we decided to buy two villas in Emerald Island Resort and would like to welcome you into one of our homes for a wonderful vacation. The Emerald Island Resort is superbly located on the US192, just 3 miles (10 minutes drive) from Disney World yet secluded in a gated community surrounded by a conservation area for those relaxing evenings. 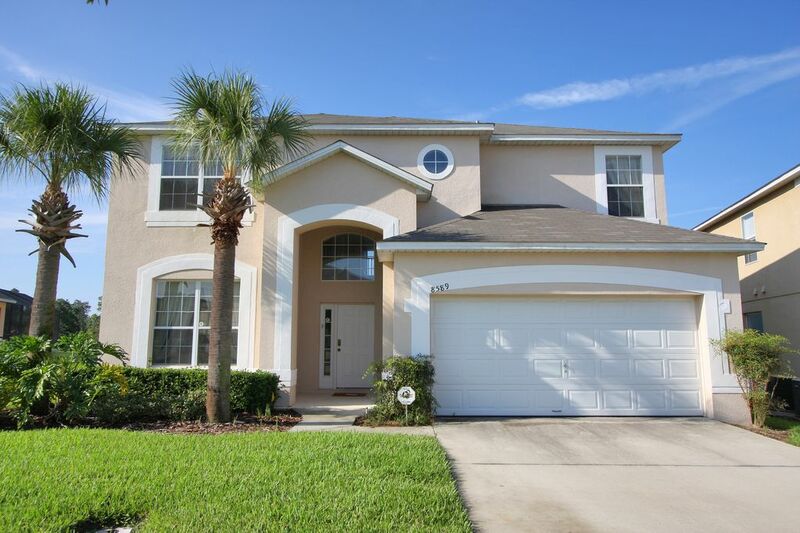 Our villa is so close to Disney World that we can visit the theme parks in the morning, come back during the evening to relax and cool off in the pool and have a bite to eat then return for more fun and fireworks at the theme parks! The south facing pool overlooks a lake and conservation area, perfect to enjoy the Floridian sunsets. Our villa isn't just close to Disney World; Universal Studios and Sea World are within a 25 minute drive to! There is a large supermarket just over 1 mile from the villa and superb restaurants are all located within a couple miles. Even on the days when we relax at the villa there is plenty to do, the games room with top of the range pool table, air hockey and foosball keeps the family entertained for hours! Orlando and Kissimmee are home to over 30 golf courses, making Golden Palms the perfect place for a golfing holiday. My group loved it. Everything was clean and everything worked perfectly. Property manager responded quickly to one question and came by, was very helpful and friendly. Great location with no rear neighbours made it very relaxing! Stress free and ideal. Thanks so much! The property was very nice. But things need to be done for the next family that will rent this property. The stove is need of an upgrade. Two burners do not work and the oven works part-time. The Mickey room TV does not work. Your cleaning crew needs to do a better job taking care of this property. There is mold in each bathroom(pictures were taken of the restrooms). Hi Johnny, I am sorry to hear there were some concerns with the property. I'm disappointed these were not notified to us or our management company upon being noticed during your stay as they would have been rectified immediately. We have very high standards for our properties and don't accept anything but the best for our guests which our other reviews show. I would very much like to see the photos you have taken of the restrooms and will show these to our management company for review. Again, I am unsure as to why you have not offered to show us these photos until after you have vacated the property when any concerns would have been rectified immediately. I hope these matters did not alter what I hope was an otherwise enjoyable stay. Stayed for a girls get together at Disney, 9 people in all, the house was great; clean and comfortable with a great pool and hot tub. Added bonus was breakfast ready for our first morning there. Beds were all very comfortable and the house had plenty of room for us all to spread out, I would highly recommend staying here if you are going to Disney, its only at 10 minute drive away. The club house was very nice too! Wilderness lodge is perfectly located for all local amenities and attractions, the choice is absolutely amazing. Golf: Orlando and Kissimmee are home to over 30 golf courses, making Wilderness Lodge the perfect place for a golfing holiday. As well as the 5 high quality golf courses in Walt Disney World, there are golf courses all within a short drive from the villa. The course was designed by Champions Tour professional and NBC golf analyst, Gary Koch. Challenging yet fun, this course consists of two distinctly different layouts that take advantage of the unique topography, offering the golfer a fantastic and memorable experience. Co-designed by the renowned masters of golf course architecture, Robert Trent Jones Senior and Junior, they created a course unlike any other in the nation. It’s lush, almost like a natural park with undulating swells and topography, a course reflective of the very best of every course they have created around the world. ChampionsGate Golf Club features two premier 18-hole championship golf courses designed by accomplished architect and golfer, Greg Norman. ChampionsGate resort offers an un-matched golf facility and is regarded as one of the top courses nation wide. Highlands Reserve sits atop one of the highest areas of Florida and offers remarkable scenery along with a course designed for hot golf. Large, fast, undulating greens make this course challenging and fun for all levels of golfers. Free pool and spa heating A booking deposit is required to secure a guests dates. All bookings require an additional security deposit of $500 which is refundable in accordance with our terms and conditions.